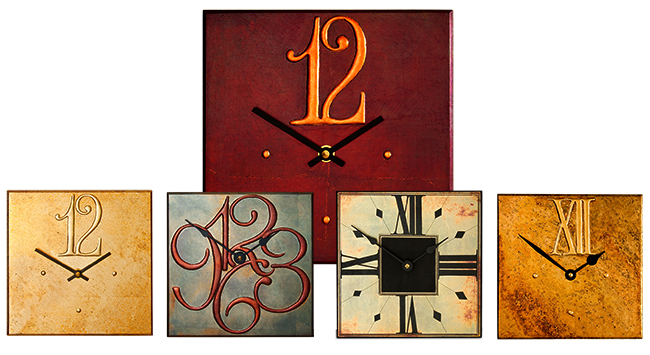 The Contemporary Square Clock Collection. My contemporary square clocks make the perfect hall or kitchen clock with their clean, simple, geometric forms they are finished in one of my unique gilded finishes creating a bold design statement. 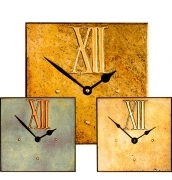 Try clicking on any of the gilded square clock designs below and see how the colouration subtly alters the character and feel of the square clocks. 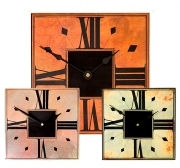 The contemporary square clocks below are shown according to the different dials I offer them with. 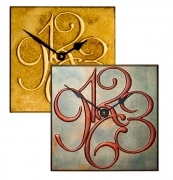 Click on the type of clock dial of your choice to see the different finishes and sizes they are available in. Unfortunately you will not be able to appreciate how the unique reflective qualities of our gilded finishes cause the colour, tone and mood of my contemporary wall clocks to subtly change, according to the angle they are viewed from and the ambient light they are seen in. As handmade clocks my square clocks can be made to the precise size you require -if our standard 180, 230 or 330mm sizes are not suitable. You can obtain prices and further information by clicking down to the individual artefact page for the gilded square clock design of your choice. You'll also find larger more detailed pictures of the contemporary wall clocks -enabling you to get a clearer idea of the true quality of our gilded clock finishes. 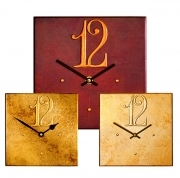 The simplest and quickest option is to choose a clock from one of my existing collections. If you require a specific size or finish there is a second option which enables you to customise one of my existing artefacts. By working direct you can call on my knowledge and expertise to help guide you, as and where you wish, ensuring you get the best possible outcome.